The Government of Nepal has participated in the REDD+ SES Initiative since 2009. Nepal is developing a National REDD Strategy and is receiving support for the Forest Carbon Partnership Facility for the implementation of its Readiness Preparation Proposal (RPP). The use of REDD+ SES was included in component 4b 'Other Benefits and Impacts' of the RPP and REDD+ SES is being used as a based for developing Nepal Safeguards Information System. On October 6th 2010, the Government of Nepal decided that the REDD Working Group will also act as the National Standards Committee for overseeing the use of REDD+SES in Nepal. The REDD Working Group is responsible for approving the plan for interpretation and application of the REDD+ SES, approving the interpretation of country-specific indicators and reviewing and approving the assessment report against indicators. A Technical Working Group composed of key stakeholders from different sectors was established in September 2011 to develop draft indicators, review and incorporate comments and support the assessment process. The establishment of the Technical Working Group provided an opportunity for some stakeholders' groups that are not part of the Standards Comittee to represent their consistuencies' interests and concerns. The use of the REDD+ SES in Nepal is being facilitated by the REDD Implementation Center of the Ministry of Forest and Soil Conservation (MoFSC) of the Government of Nepal and the Federation of Community Forestry Users (FECOFUN). The Technical Working Group drafted country-specific indicators during a workshop in September 2011. The draft indicators were published for public comment from 1 October to 30 November 2011 through announcement in national newspapers and email dissemination. The Technical Working Group developed a methodology with a series of key questions to draft the indicators to fit Nepal's context. During this first public comment period, two workshops were organized by NEFIN to seek comments from Indigenous Peoples on the draft indicators and one workshop was organized by HIMAWANTI to receive comments from women's groups. 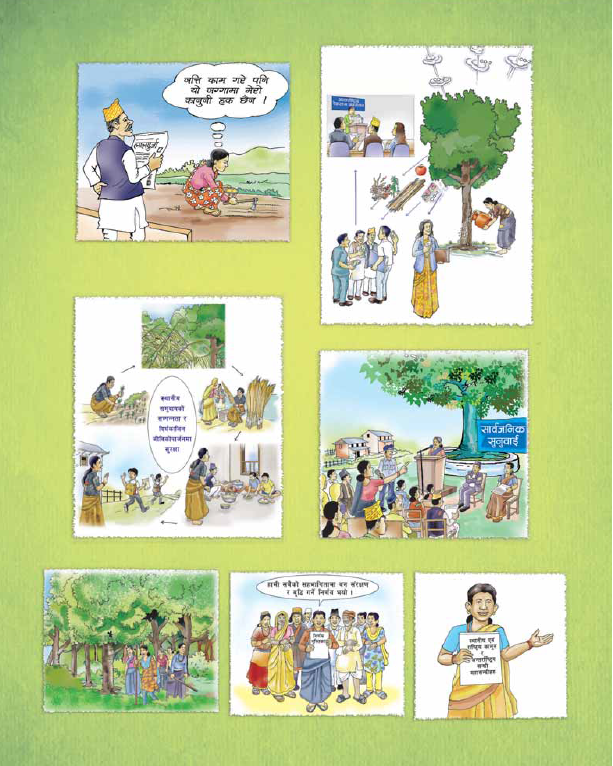 To facilitate the understanding of the REDD+ SES principles, the facilitators used a series of capacity building posters that were developed with support of the Hariyo Ban project. The technical working group reviewed and responded to comments in a second draft of country-specific indicators. The second version was submitted for public comment from 12 September to 11 October 2012 and meetings were organized with stakeholders to receive additional comments. The final version of Nepal specific indicators was approved by the REDD Working Group in December 2013. The Technical Working Group prioritized the country-specific indicators to develop a monitoring plan for the first assessment. The first assessment including collecting, compiling, analyzinf and reporting information against Nepal specific indicators will be carried out in 2015.